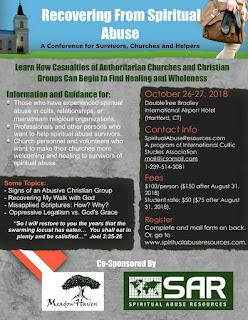 Spiritual Abuse Resources and Meadow Haven have organized a conference on spiritual abuse. Fee: $100/person ($150 after September 22, 2018). Student rate: $50 ($75 after September 22, 2018). Ron Burks, PhD, holds an MDiv and an MA in counseling from Asbury Theological Seminary and a PhD in Counselor Education from Ohio University. David Clark, a thought reform consultant from Philadelphia, Pennsylvania. He has been active in this field for more than 30 years. Doug and Wendy Duncan: former members of a pseudo-Christian, Bible-based cult. Several years after leaving, they became active in cult awareness activities. William and Lorna Goldberg, both licensed clinical social workers and psychoanalysts with over forty years experience working with former cult members. Joseph F. Kelly, a thought reform consultant since 1988. Michael Kropveld is Founder and Executive Director of Info-Cult / Info-Secte, based in Montreal, Canada. Michael D. Langone, PhD. Since 1981 he has been Executive Director of International Cultic Studies Association (ICSA), a tax-exempt research and educational organization concerned about psychological manipulation and cultic groups. Bob and Judy Pardon operate MeadowHaven, a long-term rehabilitation facility that can accommodate individuals or families who require long-term (up to a year) care to recover from trauma and cultic abuse. View the complete list of speakers with full profiles. Can the Satanic Temple survive its "civil war"? What do you do when your neighbor is a Neo-Nazi?